I’m Ollie Q. Cumber and I’m the official Mt. Olive Pickle Spokespickle. And I couldn’t be happier! In fact, I’m dill-irious! Being a Mt. Olive Pickle has been my dream ever since I was a young gherkin growing up on the vine. I don’t think there is a higher honor a Cucumber can dream about. You see, I come from a long line of Mt. Olive Pickles. 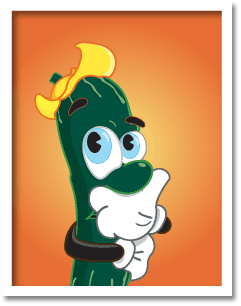 My Great, great, great, great, great, great, great, great, grand-cuke was one of the first Cucumbers chosen back in 1926 when Mt. Olive first started making pickles. He was hand selected to represent our little corner of the garden and he really put our family on the map. Every season since then, we have had a member from our Vine selected to serve in one of the 80 different varieties of pickles, peppers and relish each year. And now it’s my turn! I’m so excited to be the SpokesPickle that gets to tell the world about Mt. Olive! They have this great new website, and check this out…they even gave me MY OWN SECTION!!! Of course you already knew that if you’re reading this, but I digress! Did I tell you I was excited!!! I mean come on, who wouldn’t be excited to talk about Mt. Olive Pickles, Peppers & Relish!!! So check out my section of the site with the free downloads, online games and stuff to do outside! I’ve also got some videos I’m getting together of my travels spreading the word about Mt. Olive. These will be awesome, if I do say so myself! So, check it out and let me know what you think. I’m looking forward to sharing my experiences with you! Mt. Olive Pickles — That’s Picklicious!! !